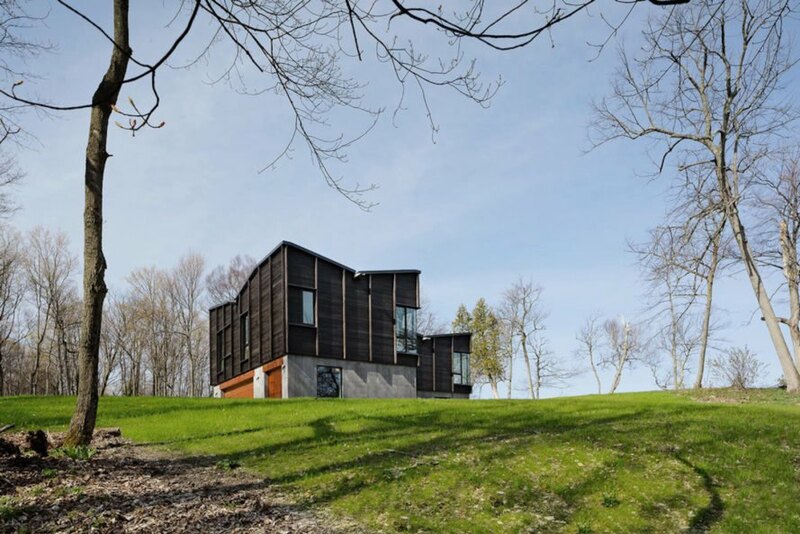 This stunning timber home embraces the Midwestern landscape with its design and use of local, reclaimed materials. 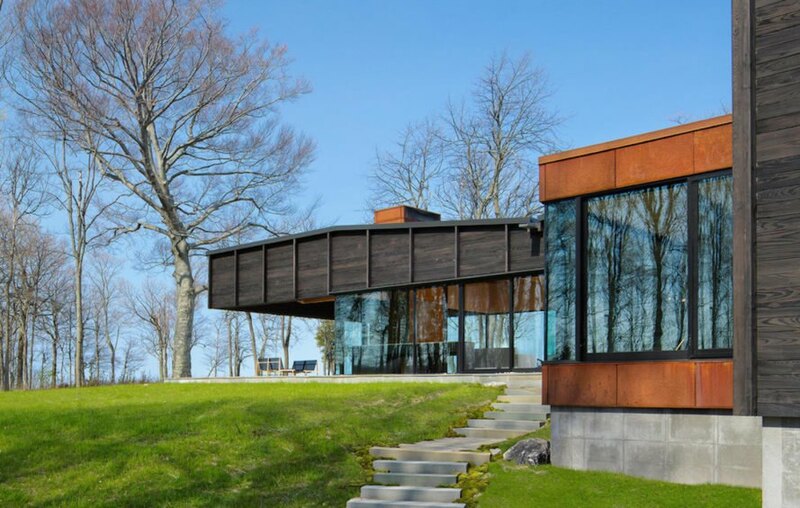 Designed by Desai Chia Architects in collaboration with Environment Architects (AOR), the Michigan Lake House boasts stunning lake views and a striking folded roof. The site-sensitive home features a native plant palette and stormwater management in addition to locally sourced and salvaged materials. Located on a woodland bluff, the 4,800-square-foot Michigan Lake House comprises three offset structures: one for the communal areas, including the living room, kitchen, and covered terrace; and the two others that separately house the master bedroom suite and three children’s bedrooms. A dining area breezeway connects the three structures. The undulating roof takes inspiration from the natural rolling terrain as well as the vernacular architecture of nearby fishing villages. The roof also cantilevers over the south end of the home to provide shade for the lakeside-viewing terrace. Shou Sugi Ban timber—charred to protect the wood from rot and pests—clads the exterior to blend the home into the landscape. The use of dark timber continues inside the home but is offset by light-colored ash, which was inhabitat.com/tag/reclaimed-materialsreclaimed onsite and milled into custom furnishings, flooring, ceiling panels, and trim work. 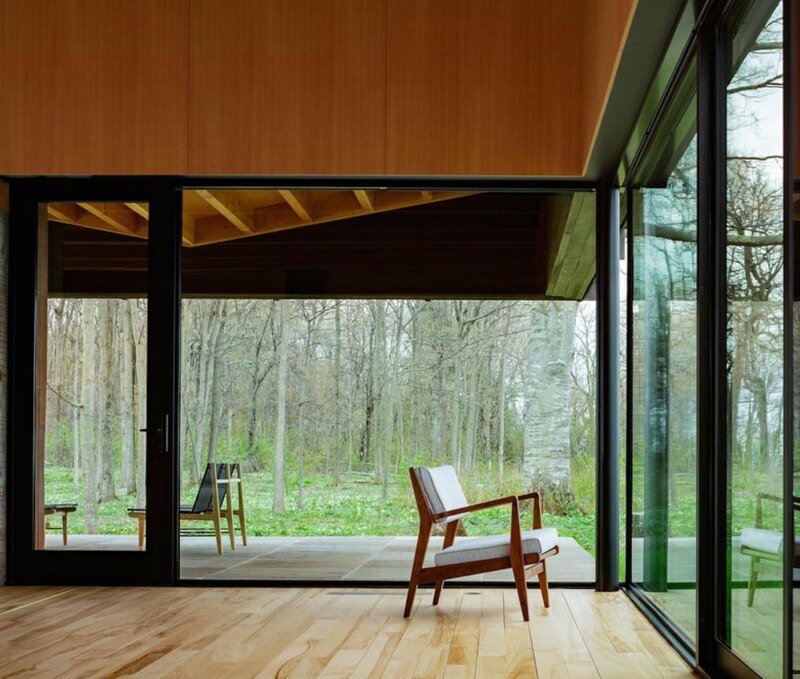 “The interiors of the house embody the indigenous landscape that once thrived with old growth ash,” wrote the architects. Locally sourced stone was used for the outdoor seating areas, pathways, and steps. This stunning timber home by the lake sensitively embraces its Midwestern landscape with its design and use of local, reclaimed materials. 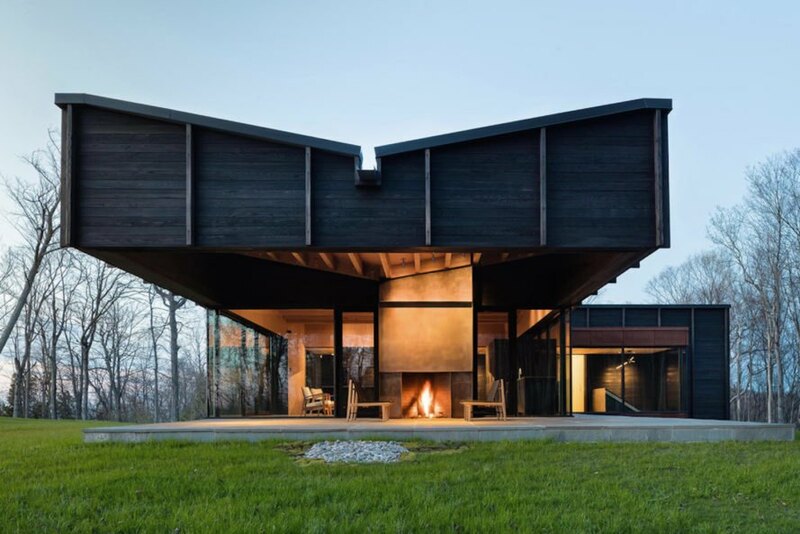 Designed by Desai Chia Architects in collaboration with Environment Architects (AOR), the Michigan Lake House boasts stunning lake views and a striking folded roof. The site-sensitive home features a native plant palette and stormwater management in addition to locally sourced and salvaged materials. 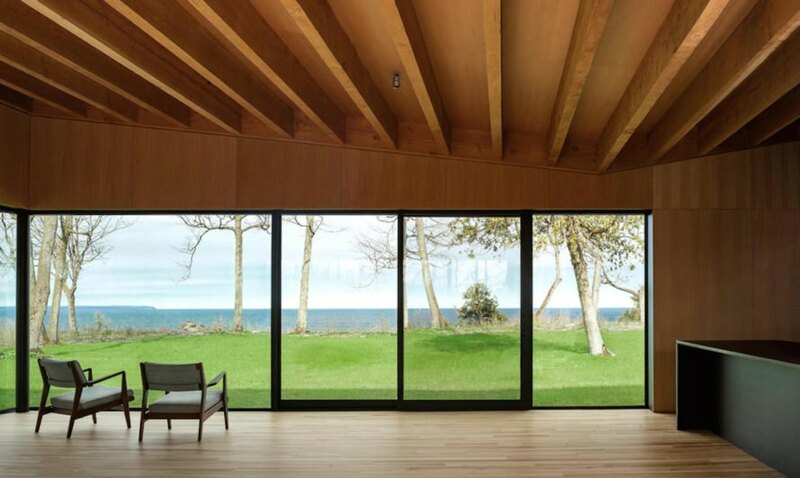 Located on a woodland bluff, the 4,800-square-foot Lake Michigan House comprises three offset structures: one for the communal areas, including the living room, kitchen, and covered terrace; and the two others that separately house the master bedroom suite and three children’s bedrooms. A dining area breezeway connects the three structures. The undulating roof takes inspiration from the natural rolling terrain as well as the vernacular architecture of nearby fishing villages. The roof also cantilevers over the south end of the home to provide shade for the lakeside-viewing terrace. Shou Sugi Ban timber—charred to protect the wood from rot and pests—clads the exterior to blend the home into the landscape. 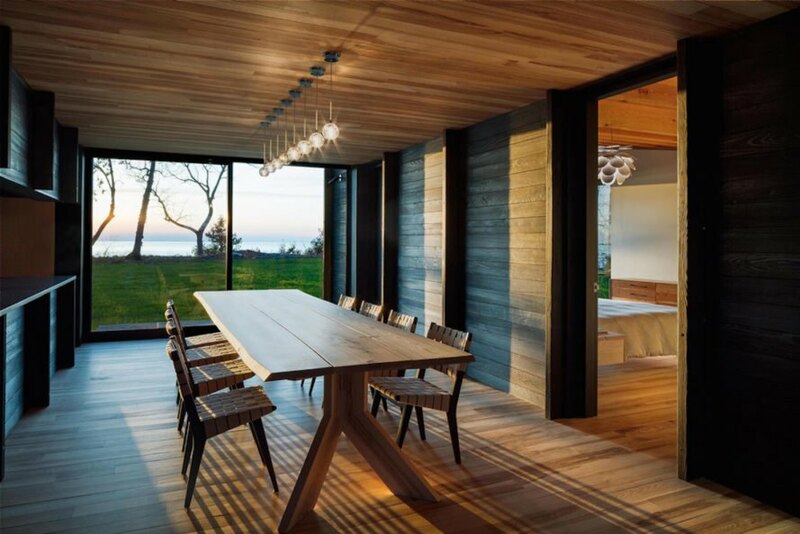 The use of dark timber continues inside the home but is offset by light-colored ash, which was reclaimed onsite and milled into custom furnishings, flooring, ceiling panels, and trim work. 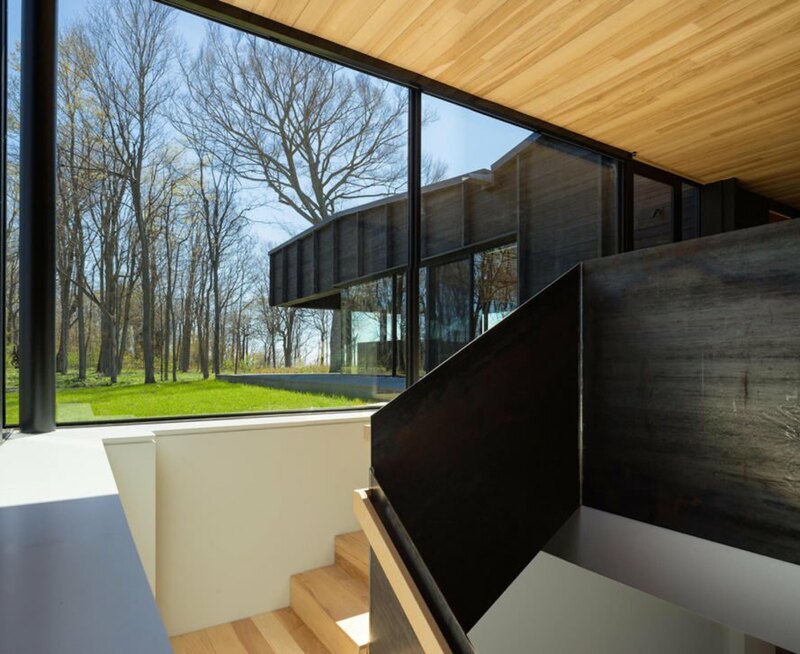 “The interiors of the house embody the indigenous landscape that once thrived with old growth ash,” wrote the architects. Locally sourced stone was used for the outdoor seating areas, pathways, and steps.